Grape vines have been grown since ancient times and they are extremely long-lived. In Maribor, Slovenia, a 400 year old vine, considered to be the oldest in the world, is still producing! The classic wine grapes Cabernet, Merlot, Syrah and Zinfandel require warm summers for ripening. 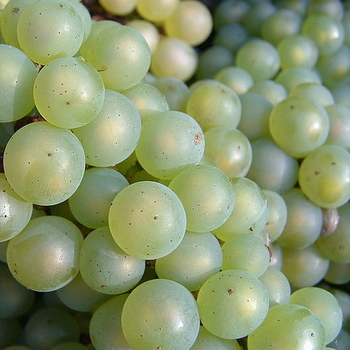 Many of the white wine varieties, such as Chardonnay, do well in cooler climates. Home wine-making has been become a popular hobby and many publications and books are available with detailed instructions. Wine grapes can also be used for juice. The wine grapes we offer are all grown on their own roots. They have low chilling requirements but factors such as soil and climate are very important for satisfactory production. The vines are usually trained on a double wire structure and pruned according to cane or spur type techniques. Late season red wine grape with small, black, strongly flavored berry. Makes distinctive red Bordeaux type wines. Requires long growing season to mature entire crop. Vigorous, upright vine. Hardy to zone 6. 100 hrs. Self-fruitful. Cane prune. PLEASE NOTE THAT GRAPES CANNOT BE SHIPPED TO OREGON, WASHINGTON, IDAHO, NEW YORK AND THE CALIFORNIA COUNTIES LISTED ABOVE. Wine grape for white Chablis to Burgundy type dry white wine. Small round berry. Best quality where summers are cool. Vigorous vine, very cold hardy to zone 6. Excellent in cooler regions. Ripens early to mid August. 100 hrs. Self-fruitful. Cane prune. PLEASE NOTE THAT GRAPES CANNOT BE SHIPPED TO OREGON, WASHINGTON, IDAHO, NEW YORK AND THE CALIFORNIA COUNTIES LISTED ABOVE. Black, round, medium sized grape, used for distinctive red wine. Produces large yields of high quality grapes, often blended with Cabernet. Best quality in cooler regions. Ripens August/September. Hardy to zone 7. 100 hrs. Self-fruitful. Cane or spur prune. PLEASE NOTE THAT GRAPES CANNOT BE SHIPPED TO OREGON, WASHINGTON, IDAHO, NEW YORK AND THE CALIFORNIA COUNTIES LISTED ABOVE. For fruity red wines. Medium sized, round, juicy, reddish black grape. Ripens early mid season. Heavy bearing. Hardy to zone 6. 100 hrs. Self-fruitful. Cane or spur prune. PLEASE NOTE THAT GRAPES CANNOT BE SHIPPED TO OREGON, WASHINGTON, IDAHO, NEW YORK AND THE CALIFORNIA COUNTIES LISTED ABOVE.